Recently, Greg and I had dinner with James Wanless, PhD, creator of the famous Voyager Tarot Deck (with over 250,000 sold) and author of many books including Intuition@Work, which I researched and referenced in my book, Eureka! Understanding and Using the Power of Your Intuition. He was in Colorado from California to do keynote talks at metaphysical conferences, so we took this opportunity to get together a couple of times to catch up and joke around. We first met James in 2003 at a hypnotherapy conference in Palo Alto. 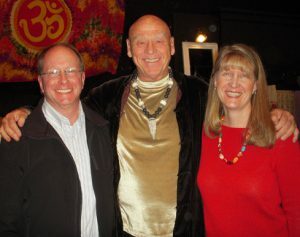 When we heard him speak, we immediately decided to receive a personal Tarot reading from him and learn more about his system of Tarot. His fanciful approach to life and his natural intuitive ability made his reading fun. Tarot cards, or oracle cards, have been around for hundreds of years to help people find direction in their lives. What is unique about James’ deck is that he spent years researching multicultural spiritual practices and incorporated these images into his cards. You can easily look at these cards and let your intuition tell you the meanings that your higher self wants you to hear. Dr. Wanless was originally a distinguished professor of political science in the Middle East. After surviving a life-threatening illness through spending a month in meditation at a Buddhist monastery, he changed his life focus to helping others with their spiritual transformation. Then in 1977, he received his first tarot card reading from Angeles Arrien, PhD, with whom I, too, studied intensively in the 1980s. As a cultural anthropologist and founder of the Four Fold Way, she approached the Tarot as wisdom teachings rather than fortune telling. This approach rang true for James and enlivened him to delve into researching the Tarot. Soon he became internationally recognized as an expert in the field. As a revolutionary thinker, James knows that your intuition can use anything as a means for communicating with yourself. You just need to open your mind and body to hearing and interpreting the messages you receive. In Transpersonal Hypnotherapy, you go into your inner room to communicate with your Higher Self. You can also do this in self-hypnosis. In Tarot, you pull a card and let your Higher Self reveal meaning through the images. No matter how you choose to access your inner wisdom, it is a valuable practice to communicate with your higher wisdom every day. While others are experiencing stress, you can know you are on your path through connecting with your intuition. Ask yourself, “What is my quest?” before you pick your first card. Know what you want, and ask for a card to give you insights into your topic. Pick your card and then ask your intuition for insights on this topic. Ask yourself, “What physical action will I take given I received this card?” Commit to this. Pick your second card. The Tarot is telling you the potential that may unfold after you take this action. If you don’t like the potential results, pick another card for more insights. Remember, any setbacks you experience are potential opportunities. When you affirm this and communicate with your unconscious in this positive way, your higher self will bring you insights and search out options for actions that can help you achieve your dreams. Keeping an open mind and an appreciative heart lets your intuition know that you are willing to listen. Visit http://www.VoyagerTarot.com Experience his new deck, Sustain Yourself Cards, with supporting book and app on his interactive site. Receive his free informative newsletter. You can increase your intuition and psychic skills from the comfort of home – courses are available through distance learning CDs at GoIntuition.com.